C. A few discussions I have had with the male members of my family (I have 2 brothers, 3 sisters and 2 parents!) about the advice / prescriptions that they had received when undergoing cardiovascular preventative screening by their local GPs. For the record – none have had any previous cardiovascular disease / events. Use this to work out a basic risk of 5-year major cardiovascular event. aust-cardiovascular-risk-charts . “The Old Boy” – 73 yo retired farmer / amateur share-trader. He has let himself go a bit – now 105kg, and has been shown to be “borderline T2DM” with a penchant for jam & cream on his scones! He is a non-smoker, has a pretty healthy total: HDL cholesterol ratio of 6 and a BP of 145/90. “Tootie” is now 45 years old and is a smoker. He has been screened and has a cholesterol ratio of 5.5. He doesn’t have diabetes but his BP is a bit high for a ‘young’ active guy at 145/90. “Trick” – he was unfortunately given this moniker after suffering with enuresis to a late age. “Trickle” being shortened to “Trick” later in his teens. Like any good nickname in Australia – hard to shake if off! Trick is only 30, he is fit, active and slim. Non-smoker, no diabetes. But he does eat a lot of junk – crazy amounts of bachelor food! His cholesterol is high – with a TC:HDL ratio of 7.5. His BP was also a bit up at 145/90. So – there you go – 3 blokes with a set of traditional CV risk factors plotted out. All of the same genetic stock basically. Imagine that you are their GP. Have a read through the Lancet paper above. Now answer me these questions. (Q1) For each family member – would you commence an antihypertensive medication for primary prevention (assume no renal disease/albuminuria )? (Q2) For each family member what would you target as a single “intervention” to try and achieve in order to reduce each fellows’ absolute risk. (Q3) Assuming no signs of malignant hypertension or end-organ dysfunction – at what blood pressure would you treat purely to reduce the BP – rather than aiming to reduce the longer term CV disease risk? Name a number X/Y? Food for thought. Looking forward to hearing your thoughts. 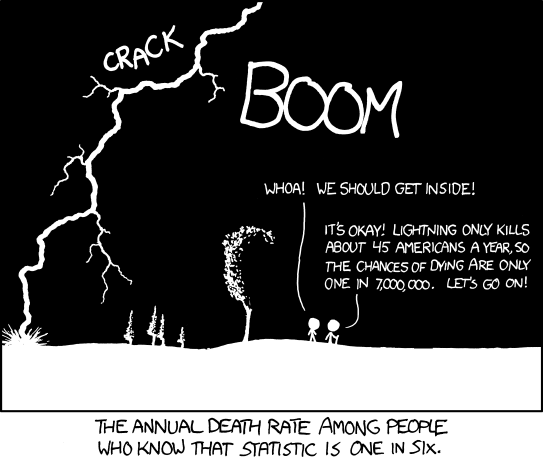 From my favourite comic: XKCD – risk is always conditional! Great topic, Casey. Yes this is something that we really should be thinking about for all our patients, even when it’s easier just to fly on autopilot and react to their presenting complaint or just keep mindlessly repeating their scripts. Q1: He qualifies as “high risk” due to age >60 and diabetes alone, but also comes in the >15% risk group based on age, cholesterol and BP. Therefore, he should be commenced an ACE and a statin to reduce his risk in addition to lifestyle advice. Q2: More than likely if he cut down on his cream scones and upped his exercise to lose a bit of weight, he may well drop his BP and BSL down sufficiently to fall in the “non-diabetic” range and therefore drop down out of the high risk category. Q3: At his current risk, he should be on the antihypertensive regardless of his BP. Q1: He falls into the moderate risk group based on his BP and smoking. He needs lifestyle intervention at this stage but I wouldn’t be starting any medications. Q2: Obviously if he could stop smoking he would improve his risk significantly so that’s where I’d be focusing my efforts. Q1: By virtue of his age he falls into the low risk group, which make sense intuitively when you think about his fitness and weight. I wouldn’t be starting any medication at the moment but would suggest that he cut down on the junk and have his cholesterol levels and overall risk looked at again in a couple of years. Q2: Diet is key here for long term healthy habits. The question about treating for hypertension alone is tricky for all of these cases. My interpretation of the guidelines is that if they don’t have any other high risk factors, then you don’t need to commence anti-hypertensives unless they put themselves into the high risk category with a BP >180/110. Still – having “grown up” being taught to treat any isolated hypertension above 140/90 it would feel a bit uncomfortable for me to sit there and watch it hovering around 160 or 170. The other consideration of course, is that our patients aren’t just boxes on a chart, and they may well decide that they don’t want to take medications, or they may get side effects which make them feel like crap. As always, we have to balance the evidence and recommendations of risk with our patients values and expectations and support them in either case.